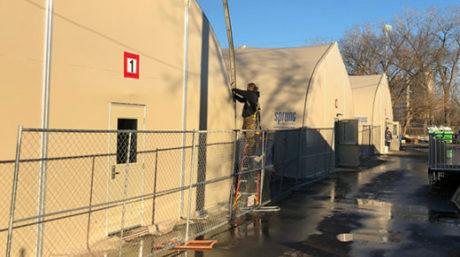 An experimental homeless shelter along Franklin and Hiawatha avenues, known as the “navigation center,” soon after construction in December 2018. Editor’s note: The article was reprinted courtesy of The Circle. The Bush Foundation has awarded the Native American Community Development Institute (NACDI) a two-year, $207,000 grant to explore community-based solutions to the chronic homelessness problems for Native Americans in Minneapolis. Minneapolis-based NACDI is leading the effort but is working in tandem with the Metropolitan Urban Indian Directors (MUID) umbrella organization for Native groups. It also has enlisted outside consultants on the project, the Lakewood, Colo.-based Indigenous Collaboration Inc. This came about late in the past year when Native groups in Minneapolis, working with the city and with various state and local agencies and nonprofits, struggled with finding emergency shelter and services for the Minneapolis homeless encampment in the Franklin and Hiawatha Avenues area of south Minneapolis. That encampment was known as The Wall of Forgotten Natives. But the 300 to 400 mostly Native people who were living in tents and sleeping bags are not being forgotten, said Robert Lilligren, president and chief executive of NACDI who this year also serves as chair of MUID. 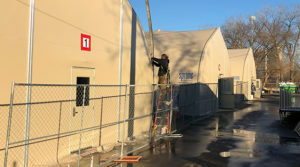 The outdoor encampment was closed in December and 140 people from the camp were moved indoors in tents at what is called the Navigation Center. It is in property owned by the Red Lake Nation that is scheduled for development as affordable housing, beginning next year. The grant is from the St. Paul-based Bush Foundation’s Community Innovation Program that assists community efforts to find problem solving solutions for the betterment of the entire region. The Bush Foundation was created by a 3M Company executive, Archibald Bush, and his wife Edith. Their philanthropic works have provided more than $1 billion to organizations and individuals in the Upper Midwest. “At the Bush Foundation, we believe NACDI’s ability to collaborate and engage the community can result in shared ownership of solutions to conditions causing homelessness in the Native community, said Rudy Guglielmo, manager of the Community Innovation program for the foundation. The mechanism for NACDI’s project is newly-formed WiiDooKoDaaDiiWag, or “They Help Each Other” in Ojibwe, that is shortened for convenience to THEO. Initial work is reaching out to people who are among the homeless. “We want to hear the thoughts from the people most impacted,” Lilligren said. That is a far greater number than the people who were living in the encampment. By various measures, Native Americans are over represented in homelessness. Sometimes lumped together with other population groups as “people of color,” and sometimes alone, statistical analysis shows Native Americans are from eight times, to 17 times, and as much as 27 times more likely than other Minnesotans – either in the state or in Minneapolis – to be counted among the homeless. Regardless of measures used, there is no disagreement that the Native population is over represented. That’s where “out of sight, out of mind” problems often hurt the Native population, said Lilligren. MUID organizations and leaders came together last fall to address immediate needs for shelter and services, especially with winter approaching. They continue to look at what services will be needed when spring arrives and the Navigation Center is closed. Longer term, however, THEO and its partners and allies are looking for ways to tackle the historic and ongoing problems of homelessness for the Native community, Lilligren said. Bush’s Guglielmo said NACDI’s history and “depth of relationships” makes it ideal for lead the effort. The grant was for $200,000 and an additional $7,000 was provided for special “engagement” needs, he said. Lilligren said NACDI did a nationwide search for guidance when the grant came through. That brought Indigenous Collaborations into the picture as a partner. The leadership team for WiiDooKoDaaDiiWag/ THEO includes Lilligren (White Earth Ojibwe), consultant Carrie Day Aspinwall (Leech Lake Ojibwe), and from Indigenous Collaborations, Lesley Kabotie (Crow Tribe of Montana) and Paul Kabotie (Hopi Tribe of Arizona and Santa Clara Pueblo from New Mexico). The Kaboties are president and vice president of Indigenous Collaboration.